Chicago Sign Company and its wide array of sign and graphics options allow you to choose only the best promotional signage that best suits your brand’s personality, your audience, and even your budget. We not only give you signs that catch attention, our products do so much more than that. 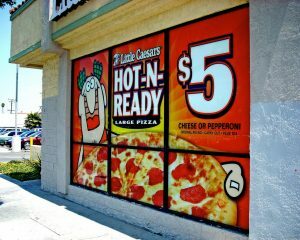 Our promotional signs effectively help convert passersby to paying customers, and impressions to income. With years of experience in the sign-making business, Chicago Sign Company fully understands a quality promotional sign’s power of persuasion and the potential profit it could bring in. This is why our team strives to plan out, design, print, manufacture, and install premium promotional signage that prompt impactful interaction with your potential customers. Chicago Sign Company understands how important it is to present customers and potential customers with a cohesive brand experience. 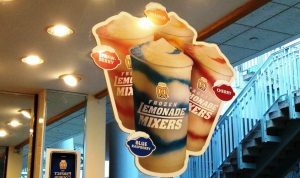 As tried-and-tested signage provider, Chicago Sign Company not only manufactures great signs, we also help you out with other critical promotional factors that you may overlook. These include project management, design, placement, and installation. 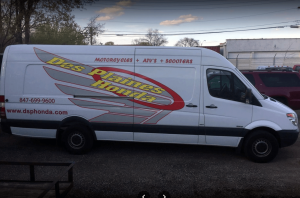 One thing that Chicago Sign Company is proud of is the fact that we do our best to give you the exact sign that your business needs to advertise itself. We do wall or fascia signs, awnings, pylon signs, monument signs, dimensional letters, illuminated signs, feather banners, hanging signs, floor signs, and even window decals. Our clients deserve only the best, and this means that we won’t settle with giving you just any sign. Chicago Sign Company provides you with the promotional signage that is right for you, your needs, your market, and your budget. Get your business noticed wherever you go by using any of Chicago Sign Company’s lightweight, easy-transport promotional signs. Whether you need them for trade shows, festivals, conventions, concerts, or other promotional events, Chicago Sign Company can provide you with powerful advertising signs and banners that are sure to convey what your brand wants to say. 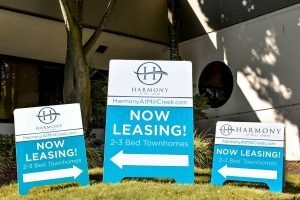 Chicago Sign Company is more than capable of delivering impressive and durable promotional signs that make an impact wherever you decide to place them. 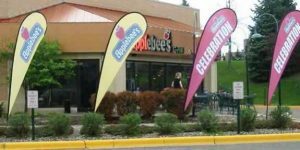 You can choose from flag signs, vinyl banners, teardrop banners, roll-up banners, tents, A-frame signs, wearable signs, and many more. We want your signage to look stunning and stay stunning for a long time. Chicago Sign Company products are all made from the finest materials and digitally printed with high-quality ink to make sure that they stand against indoor storage, constant transport, and outdoor elements. 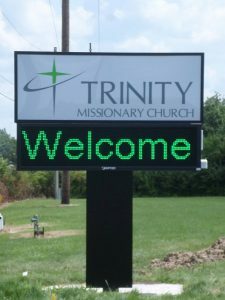 Chicago Sign Company offers an impressive selection of the latest technology in electronic signs. You can choose from fluorescent signs, high-intensity displays (HID), incandescent signs, LED signs, neon signs, and many more options to see which one best suits your business needs. When we say “full service,” we meant it. Chicago Sign Company has the knowledge, manpower, and network of suppliers needed to give you what you want. This, of course, means that our team of local signage experts are fully equipped to assist you in making strategic decisions in design, sign type choice, material selection, layout, installation, and even regular maintenance. Call Chicago Sign Company today at (312) 626-3766 for your Free Consultation with a Promotional Signs Expert!